sounds of the endless South Dakota Prairie vistas. Continental breakfast will be awaiting you in the Main Lodge. Help yourself to muffins, toast, bagels, cereal, yogurt and fruit that is laid out for our early risers. Or simply grab a cup of fresh hot coffee and relax by the fireplace, get some business done in a conference room, or relax in the library as you anticipate the day ahead. Professional shooting instruction is offered by the Sporting Clays Barn at 8:00am for those who desire to dial in their shot. Get a tip or two from our instructor or enjoy some practice on your own; the choice is yours. Continental breakfast has now been replaced by a fresh hot breakfast served in the Main Lodge. Whether it is piping hot homemade biscuits and gravy, fresh sausage patties, pancakes or eggs, there is surely something your stomach will crave. Oatmeal, grits, fresh fruits and juices are also available in addition to premium coffee. After consuming your fill of a bountiful breakfast, it’s time to prepare for the morning hunt. 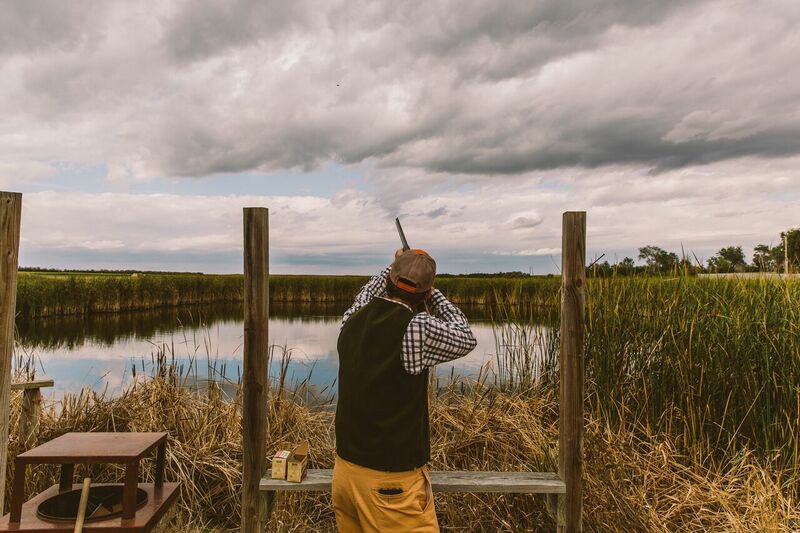 You can use this time to adjust your attire for the weather, relax while envisioning the perfect shots ahead, or warm-up with a few more rounds sporting clays at our world class range. If you need any additional hunting attire, now’s the time to check out our top apparel lines in our Pro Shop. And on Day 1 at 9:45am, you’ll take in a short safety briefing and video in the theatre room prior to departing for your memorable and safe hunt. Finally, the moment you’ve been waiting for has arrived. It’s time to load up the bus and join your professional hunting guides and their savvy bird dogs waiting impatiently in the comfy confines of their pull-behind trailer. At Paul Nelson Farm, you only hunt with your own group of family and friends; the fields are yours. In less than 5 minutes, you’ll be walking slowly in a line and waiting for your seasoned hunting guide to yell, “Rooster!” Soon, the sky erupts with the sound and sight of brilliantly colored ring-necked pheasants and chukar. This is your life for the next 3 hours! Following your successful morning hunt, there’s no doubt you’ve worked up an appetite. Your group will be treated to a delicious lunch back at the Main Lodge. On any given day, choices include homemade fried chicken, chili, homemade soups, beef stew, Jessie’s famous meat loaf, grilled chicken sandwich, sliced turkey, homemade desserts. Mmm! Mmm! Wonder what’s for lunch today? This time is set aside for our guests to catch up on calls and emails that they may have missed during the morning hunt, do some quick bass fishing in Paul’s Pond, try some additional sporting clays if desired or simply relax in your private room or one of our many executive lounges outfitted with plush couches, HD television and high-speed WiFi. It is not unusual to find yourself reveling about the best shots of the morning in anticipation for the afternoon ahead. After being well fed and a brief rest, it’s time for an unforgettable experience and unrivaled afternoon of wingshooting in the heart of pheasant country. The next 3 hours will erupt much like the morning and the time will pass with incredible speed as you raise your gun to the sky for more wing shooting shared with friends and creating lifelong memories. Great conversation will be in full gear and memorable moments will be shared. Relive the events of the day in front of the fireplace or by one of our outdoor fire pits or the balcony of one of our lodges watching an amazing South Dakota sunset. Hot hors d’ouvres will be served for your group’s enjoyment including jumbo shrimp, specialty dips and pheasant prepared in a showcase of ways. Cocktails are available at each of our eight fully stocked bars, and it is likely a sporting event will be playing on the TVs. This is where relationships are strengthened. Nothing can bring a group together like Dinner – truly a time to enjoy your group at their own table. Whether the evening menu is mouth-watering Prime steaks, thick cut pork chops, pheasant & wild rice, or our specialty – Paul’s prime rib, we are certain this will be a time to celebrate and remember the day and the people together. 90+ point bottles of wine, premium homemade meals, friendly conversation, a tasty dessert, and an after-dinner drink will make for a memorable feast. And on that lucky evening, the sound of Cheryl on the harp will bring the room to life with an ambiance unsurpassed at Paul Nelson Farm. By this time of the day, most of our guests are looking for a comfortable chair in front of the fireplace, watching a game on the movie theater screen, socializing with table shuffleboard and drinks in one of our lounges or enjoying a cigar in one of our designated poker/smoker rooms… could there be a better way to end a day with close friends and associates? And when you have finally reached the end of your day, lumber in to your own private room. Your plush bed and linens will help provide a quiet night on the prairie with un-interrupted sleep finding you rejuvenated in the morning with the fact that you get to do it all again!